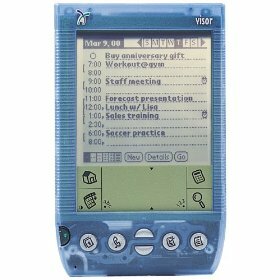 This was the Handspring Visor. Mine was Bondi Blue-ish, just like the one in the picture. 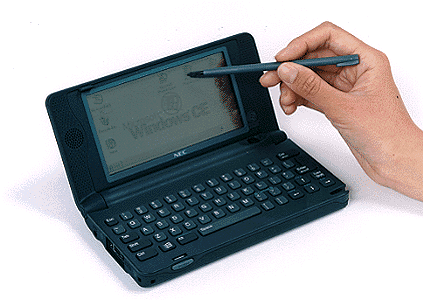 They had licensed Palm OS, and I could actually sync it with my Mac. This device, though, was very different than my last. It was small, and I could easily fit it in my pocket and hold it in my hand, but it never worked well for spreadsheets or documents. Even if the handwriting recognition wasn’t a problem, the small screen size was. But it worked well enough for writing reminders and doing my calendar. 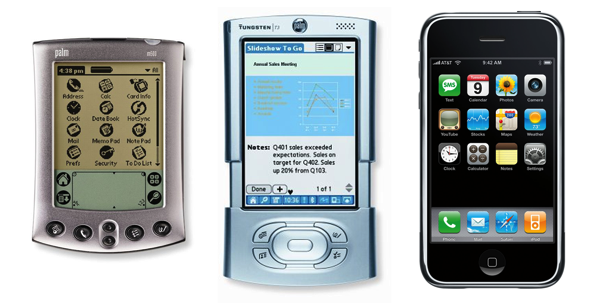 Through the years I cycled through a few more devices…. So I’m going to give the iPhone 6 Plus a try because I miss the experience I had with my MobilePro. I want to have a large screen that is comfortable enough for making some edits to a complex spreadsheet, or even add a few slides to a Keynote presentation while I’m waiting for lunch to be prepared. And the world has changed to support this paradigm. My documents are available to me from anywhere via iCloud, but my current iPhone hasn’t been a great device for edits on the go. I love my iPad, but the iPad is the sort of thing that goes into my laptop bag, not something that is carried on my person. It’ll be an experiment. I know it’s going to be painful for one handed usage. Maybe I’ll go back to the smaller size next time. But I’m willing to struggle through paying with my groceries with a giant iPhone to give it a try.